The Ultimate New Home Gift Guide. One of the things we love about home design is that you can creatively integrate the things you love as well as your lifestyle into your home using fabulous décor. Your choice of lighting, throw pillows, home organizers and even the wine glasses that you use when entertaining guests can all reflect your personality and design aesthetic, whether you are a nature lover, travel lover or a lover of all things luxe! It's especially important to know one's taste when gifting them with something beautiful for their new apartment or home and finding beautiful but most importantly unique gifts can sometimes be difficult. Which is why we have created the ultimate new home gift guide with everything from eco-friendly home décor finds, to unique pieces that are hand crafted in exotic locations, to absolutely irresistible and luxe décor items which are sure to wow! 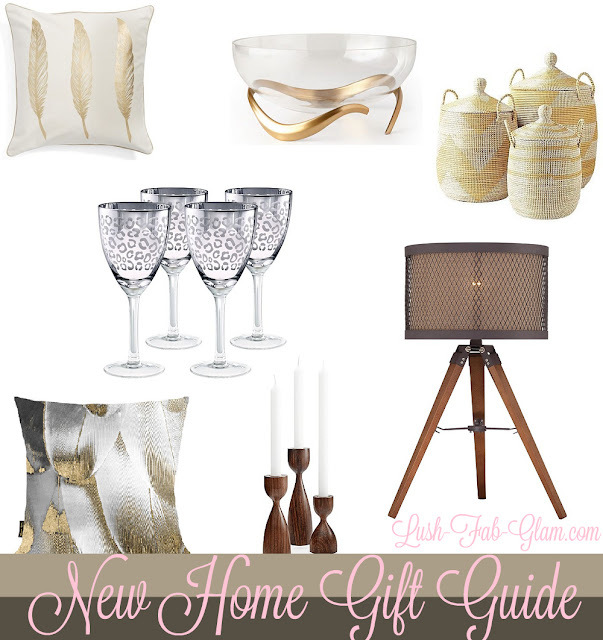 Are you a travel, nature or luxe decor lover and which featured new home gifts are your favorite? Share with us by leaving a comment below. I want everything in this post!! That tripod lamp is gorgeous! I want one so pretty. Would love the pillows, they are gorgeous! Yes they are, there's something about the gold feathers. They are one of our favorites in the guide! I really like your decor selection! Gorgeous, perfect for all homes. Agree, they are perfect for all decor styles. that tripd lamp is awesome!